Lemongrass, ginger, Thai chiles, cilantro, soy sauce, and fish sauce infuse typically smoky barbecued ribs with Asian flavors. In medium bowl, stir together all marinade ingredients; pour over ribs in heavy, resealable plastic bag. Seal bag and refrigerate for 4-6 hours. Turn the ribs two or three times while marinating. Prepare an indirect medium fire in grill, with a drip pan in the center. For a gas grill heat grill to medium and turn off any burners directly below where the food will go. With the lid closed, the indirect heat method serves as an oven, circulating heat evenly throughout. Remove ribs from marinade (discarding marinade), place in rib rack and place on grill over drip pan, away from the heat. Cover grill and grill for 1 1/2 hours, until rib meat is very tender. 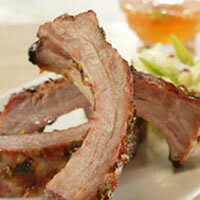 Transfer the ribs to a cutting board, cut into serving portions.